Et Verbum: The Condition of the Suffering souls in Purgatory, by Rev. John A. Nageleisen. On the Means of Relieving the Suffering Souls. Part 30. The Condition of the Suffering souls in Purgatory, by Rev. John A. Nageleisen. On the Means of Relieving the Suffering Souls. Part 30. § 45. On what Days are Requiem Masses Permitted? 260. The use of the formula of the Requiem Mass is restricted to certain days. The permission to use this formula depends on the general rules of the Church concerning the celebration of the Holy Sacrifice, and on the special privileges granted to certain countries, dioceses and individual priests. Hence a direct and explicit answer to the above question can not be given. 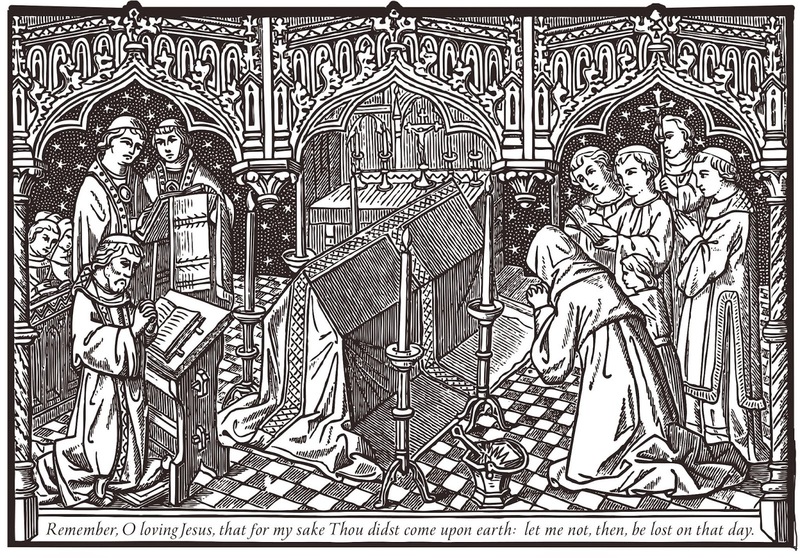 All that can be said is, that low Masses of Requiem are permitted on many days; that there are few days on which a High Mass of Requiem is prohibited; and that High Mass of Requiem at burials, with the corpse present, is permitted every day except on great feasts. If for some adequate reason the corpse cannot be brought to church, for instance on account of the infectious character of the deceased's illness, etc.—then in such a case also the Requiem High Mass at burial may be used, the same as if the corpse were present.—For explicit information whether the Mass of Requiem can be said on a certain dafy, let every one apply to his pastor. 261. In virtue of a special privilege some priests have the faculty of saying the Mass of Requiem several times a week, which is otherwise contrary to the general rule of the Church.—In the former kingdom of Aragon in Spain, and on the isle of Majorca which belonged to it, there obtains a privilege in virtue of which secular priests are permitted to celebrate two Masses on All Souls' Day, while religious are even allowed to say three. The Dominicans in Pampeluna also have this privilege. Repeated applications to the Holy See to extend this privilege throughout the whole world were answered in the negative. Thus by Pope Urban VIII., Clement IX. and Clement XI.